Take a look at this little guy. If you don’t know his story, what can you tell me about him? You’ld probably use words like “chubby cheeks,” “tank” and “solid” right? The oxygen hose cues you in that there is more to his story than you know. But, you don’t know his backstory. His name is Henry George and he is 11 pounds and 3 ounces. He was born into a family that adored him before they even met him. His home would balance out a bit from Mommy, 3 girls and daddy. Yes! Another male in the family! Henry’s backstory is a story of some painful times, sleepless nights and worry upon worry. Henry’s backstory is one that reveals a powerful God, a family’s strong trust in Jesus and the result of prayer after prayer. Henry came by emergency surgery at 24 or 25 weeks. (forgive me for not knowing the actual specifics. All I remember was nights up struggling with my disease and using the time to pray for Hank). Like a dinner guest who shows up Monday for an invitation for the coming Saturday, we weren’t ready for Henry yet. We’re all used to guests who show up an hour early or maybe even a couple hours. We scramble but it all works. But what about a guest who shows up 6 days before your dinner party? I’d probably give them a confused look and let them know to come back Saturday. There was no going back for Henry. He was here no matter what the outcome. A lot of us shook our heads sadly knowing it was just too early for Henry to survive. The Google searches yielded a few promising stories but most just confirmed that Henry was born too early to make it very long. So many began praying. Little Henry, 1 pound and 10 ounces, without his momma being able to hold him needed help. 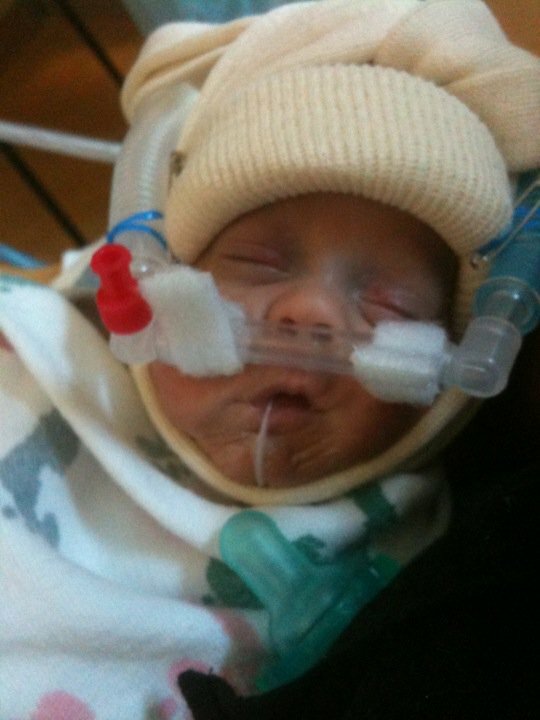 There were nights I could only pray, weep and plead with my Father for little Henry. When my only offering is shattered praise. I will worship you and give you thanks. Even when my only praise, is a broken Hallelujah. Henry is home with his family now and he’s a miraculous little chunky monkey. He still needs our prayers as he grows but each and every day is a gift. Someday, I pray, Henry will stand firm to tell His backstory. I see him telling people of the power of a mighty, mighty God and all the love that His people give. I pray he will point people to the Grace of Jesus. What is your backstory? I’d love to read it in the comments. My backstory is still being written. I’m still fighting, still struggling and only can manage to sing a “broken hallelujah” right now. My little buddy “Hank the tank” reminds me that nothing is impossible for my God. Is your backstory still being written? Maybe I’ll get out of the hospital today … maybe I won’t. Lord, I want to be content no matter what. Touching, Scott. Really touching. You’ve not been sending your sobering stuff–OR, my own crashed computers and super-busyness has proved a diversion. I had no idea about ‘lil Hank. You’re back on my list. Hank, too. Backstory? Man o man, is there. I sit here virtually unaffected by my 4th stage prostate cancer awaiting my next girlie hormone shot in another month. Celebrated my 71st birthday yesterday in unusual ways…like ending five grueling days helping my daughter and family move out of their miraculously sold home, getting three months free rental while we await the birth of number six, THEN my pioneer wagon quality daughter and therapist hubby are heading to Colorado to open their intensive family intervention ranch. The back story to my sitting here appearing quite healthy, aching back and all, is that God’s extraordinary, incredible, undeserved Grace has nourished all three generations and kept us glued together through Him. beautiful story of God’s mercy and love; please know we are all praying for you in that same way, Scott! my back story is still and always will be written. from a child I have had a fighting life in so many ways. But my God has been with me every step of the way. I feel him every waking moment of my life. I also feel him watching me when I sleep. sometime he wakes me just to talk to me , He is my friend. some of you would be very surprised about my life story. No matter how bad it was at times. HE HAS A RESON FOR EVERY SEASON IN MY LIFE.